Nuts and seeds contain enzyme inhibitors for the purpose of protection. The enzyme inhibitors keep them in a hibernation state until conditions are optimal for sprouting and growth. These enzyme inhibitors contain a substance called Phytic acid. Phytic acid is the principle storage form for phosphorus in plants. Plants need this stored phosphorus when they are ready to begin sprouting. Phytic acid can be both harmful and helpful in our diet. Phytic acid contains antioxidants that are particularly protective against kidney stones and cancer. Phytic acid will also bind with and impair the absorption of iron, zinc, and calcium. Phytic acid also interferes with enzymes we need to digest our food specifically enzyme pepsin, which is needed for the breakdown of proteins in the stomach, and amylase, which is required for the breakdown of starch and trypsin, which is needed for protein digestion. All plants contain various amounts of Phytic acid and although much of it is naturally neutralized during the digestive process, there are foods that can become a problem because of they are especially high in Phytic acid. Nuts and seeds contain high amounts of enzyme inhibitors and neutralizing it greatly benefits the digestive process and allow us to fully utilize the available minerals contained in these nutrient dense foods. Soaking nuts and seeds in a simple solution of salt water helps activate other enzymes that de-activate the enzyme inhibitors. Many traditional cultures naturally soaked or sprouted seeds, but this step is hardly ever taken with the large scale production of food in our culture since it is time consuming. It is, however, a simple and inexpensive thing to do at home and can greatly increase the nutrient content of the seeds and nuts you consume. Do I really need to soak all my nuts and seeds? Soaking and dehydrating nuts can be time consuming so you may be wondering if it is really necessary. I believe that it is worth the investment but ultimately you will need to decide that for yourself. A robust and healthy digestive system can generally handle a certain amount of phytic acid and consuming a diet with animal protein will in fact help the body to absorb iron even in the presence of pytic acid. If you consume high quantities of nuts and seeds and experience the following symptoms then soaking would be a good option for you. Keep in mind that the amount of Phytic acid is different in each variety of nut or seed. Brazil nuts, almonds, walnuts and hazelnuts contain the highest levels of pytic acid. Be aware that not all nuts and seeds can be easily soaked. For example flax and chia seeds gel when soaked and are very difficult to work with. Ultimately it is your decision and you will have to weigh the benefits and see if the process is worth the time investment for you. Personally, I digest nuts much better once they have been soaked. They also taste so much better and I know that the nutrients they contain are more available. Soaking and dehydrating organic raw nuts and seeds also creates an end result similar to roasted nuts, but without the added vegetable oils or high temperature roasting that can damage the nutrients and enzymes in these foods. How Do I Soak Nuts and Seeds? All you need is a container, some water and a little salt. You can follow the recipe outlined below or click on the image below for a printable version. This chart will come in handy with specific times for soaking and drying times based on the variety of nut/seed you’re using. 2 cups of raw*, organic nuts or seeds, when soaking nuts and seeds it is best to soak one kind at a time because soaking and dehydration times will vary. 4-6 cups warm filtered water, enough to cover the nuts and allow for some expansion. Place the water in a medium-sized mixing bowl. Add the salt and stir until dissolved. Add the nuts or seeds, making sure they are completely covered with the water. Leave uncovered on the counter or other warm place for several hours. (See printable chart below for recommended soaking times). After soaking rinse in a colander. Unless you are going to use the nuts/seeds within 5-7 days it is important to dehydrate the nuts. (Since the enzyme inhibitors have been deactivated they are now extremely susceptible to growing mold and should be stored in the refrigerator and used within a week). Dehydrate the nuts/seeds either in the oven or using a food dehydrator. Spread them onto a baking sheet or the dehydrator shelves. If using the oven bake at the lowest setting, 105-150 degrees Fahrenheit is an optimal temperature and follow you user guide when using a dehydrator. Dehydrating nuts can take up to 12-24 hours. If using the oven check them every couple of hours. They are done when they are crunchy and not soft or moist in any way. They will now have the taste and texture similar to a roasted nut. 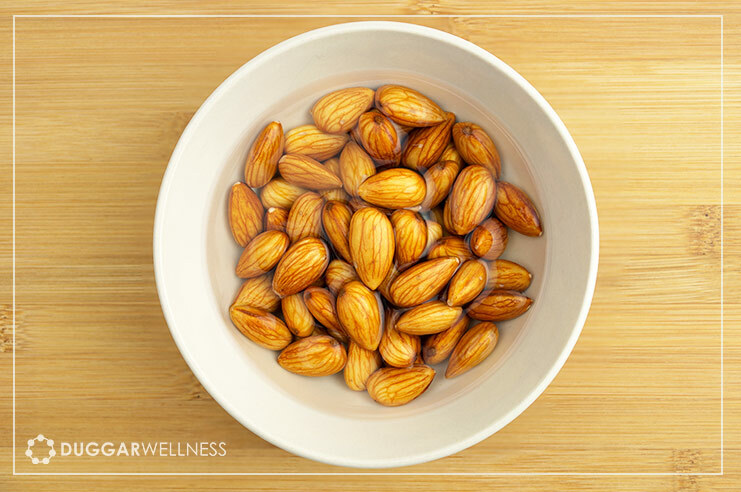 *U.S. grown raw almonds are no longer available commercially. Since 2007, all almonds grown and sold in the U.S. must be “pasteurized.” The process of pasteurization means fumigated with chemicals—or steamed, if organic. Cashews that are labeled raw are not truly raw. In order to be edible cashews must undergo two separate heatings at harvest. To get truly raw almonds and cashews with all their enzymes and vitamins intact, you must get them directly from the farmer or suppliers like Sunfood, Terrasoul or Vivapura avaiable on Amazon.com. Fallon, Sally. Nourishing Traditions. Second ed. Washington, DC: New Trends Publishing, 2001. Arnarson, Atli, PhD. “Phytic Acid 101: Everything You Need to Know.” Authority Nutrition. July 2015. Accessed March 2015. https://authoritynutrition.com. Kresser, Chris, B.S. L.As. “Another Reason You Shouldn’t Go Nuts on Nuts.” Chris Kresser. September 23, 2011. Accessed March 2016. https://chriskresser.com/another-reason-you-shouldnt-go-nuts-on-nuts/.